You’ve decided to build a catio so your cat can enjoy the outdoors while always staying safe and protected. 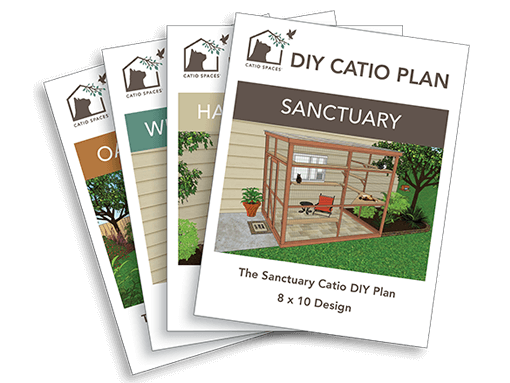 You’ve planned HOW you are going to build the structure with a DIY Catio Plan but perhaps you aren’t sure where to locate the catio or whether to use a window, door or wall cat door to access the outdoor space. In addition to the design features that come with the catio plans, such as shelves and roofing options, your catio can also be customized to suit your cat’s lifestyle. Each cat is different. They all have their own likes, dislikes, and special requirements. 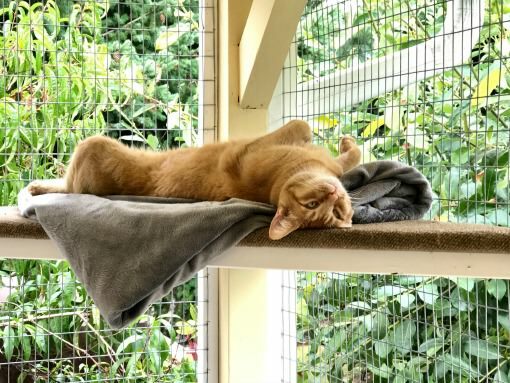 Designing the interior of your catio to match your cat’s personality and physical needs will help ensure that your cat is happy in their new outdoor space. If you have an outdoor cat, does your cat wait for you by the door or does your kitty prefer that you leave the window cracked so they can come and go as they please? 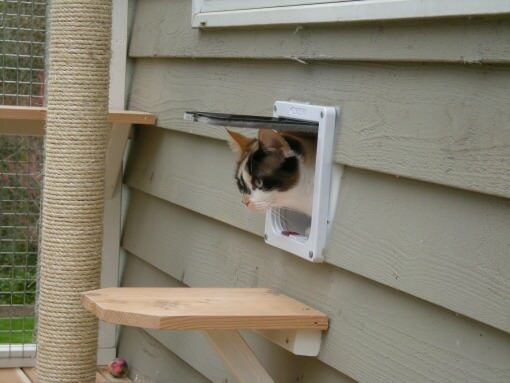 Cat doors are available in a variety of styles for installation in a window, wall or door that provide your cat with direct access into the catio or into a cat tunnel leading to a freestanding catio further away from the house. No matter where you put the cat door, they’ll adapt to it once they know they have access to fresh air and the stimulation of the outdoors. For indoor cats unfamiliar with cat doors, you can prop up or tape the door open so they get used to going in and out of the door and become acclimated to their new catio space. If your cat is the type that slowly and carefully checks out the yard before they venture out, and often darts back in if they are startled, you may want to use the Window Box, Haven or Sanctuary catios. 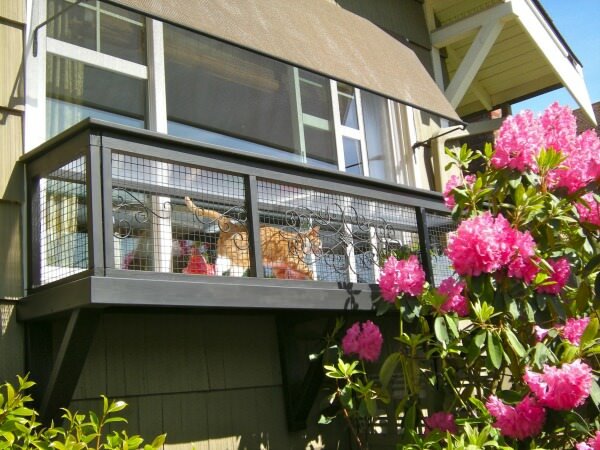 Each catio attaches to the home and provides quick and direct access in and out of the house. 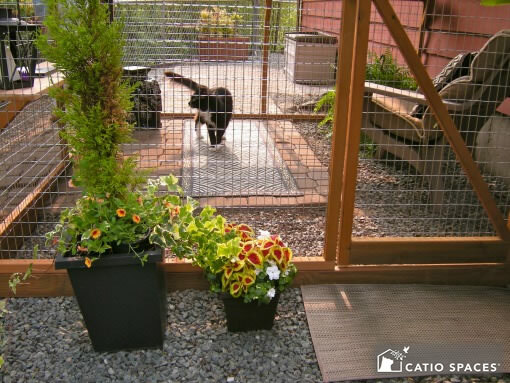 If you cat likes to venture out for hours, then placing an Oasis catio in the far corner of your yard with a tunnel leading to it can help satisfy their wandering need. 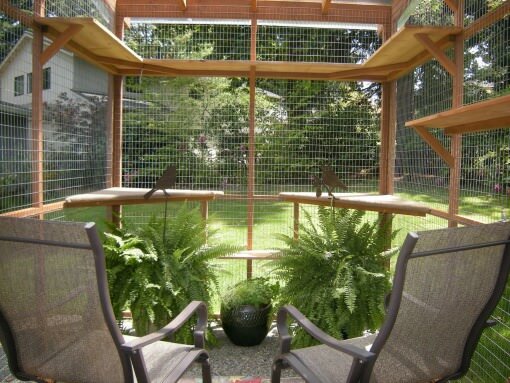 You may even want to consider building 2-3 smaller catio spaces in your yard and connect them to each other with enclosed tunnel walkways. Does your cat like to hide under tables, or in tight spaces, and watch the world go by? Or do they like to perch on the tallest furniture in the room where they can survey their territory from above? For the cave dwellers, a smaller catio located closer to the ground may make them feel safe and secure. They may also appreciate a few enclosed spaces – a wooden box or dome shelter – inside their catio. 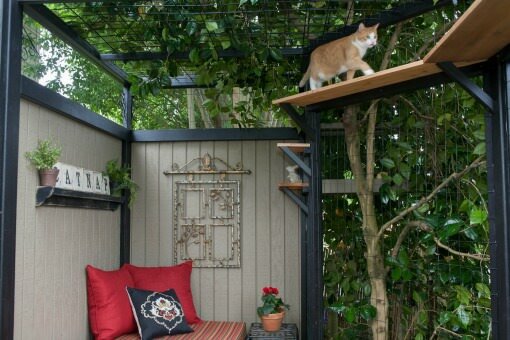 For the high observers, a taller catio with lots of shelves and perches for vertical movement is ideal. While most cats love to bask in the sun, some overheat easily – due to breed, amount of fur, age – and may prefer to lay in shadier spots. 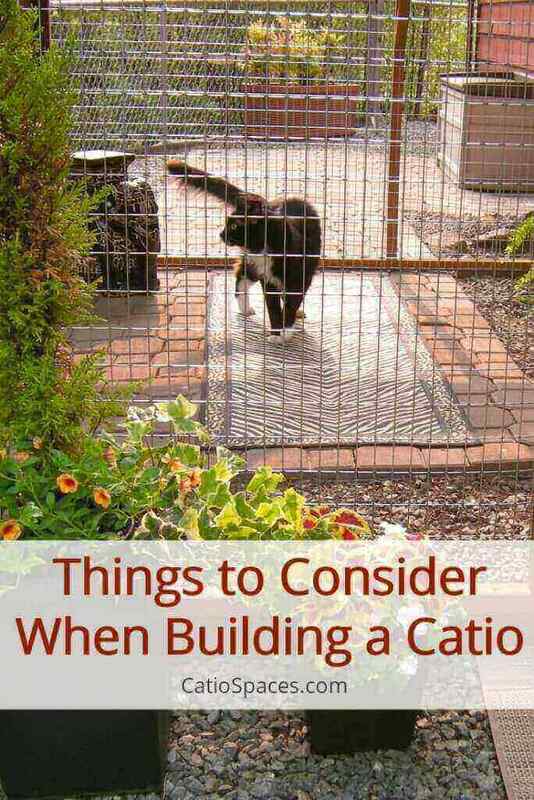 Definitely consider this when deciding where to locate your catio. If your cat is a sun lover, be sure to build your catio in an area of the yard that receives sun for at least part of the day. If they’re a cool cat, then locate the catio in a shadier spot. If your yard doesn’t get much shade, consider covering your catio with shade cloth, a solid roof or installing sun blocking panels near shelves or corner perches. Kittens and senior cats have very different needs. While a senior cat might be happy with a few low and strategically-placed shelves to sleep on, a kitten will likely want to explore higher spaces and seek stimulation. If you’re building a catio for your kitten, add shelves at varying heights for exercise and to burn off some energy. Kittens love to play so consider adding balls,chasers, catnip toys, a cat crawl tunnel or hang teasers for mental and physical stimulation. An older cat may be content to lay around on a few easily-accessible shelves and watch the world go by. If your senior cat is not able to jump up easily, place fewer shelves in the catio space. That way you’ll have room to add ramps, box steps or pet stairs to allow your cat to safely reach a special spot on his own. Whether you have an indoor or outdoor cat, a catio can enhance their wellbeing and provide peace of mind knowing your cat is always safe outdoors. Learning how to build a catio is just the beginning. Before you start, plan your catio based on your cat’s age, needs and wants. The purrs will be worth it!